In an earlier post I commented on Il Nostro Posto's attempts to create a genuine Italian trattoria feel, which I didn't feel were a 100% successful. In part, that was probably because I was subconsciously comparing it with La Bussola, the first restaurant we ventured to in the area and have since returned to probably more than any other. Why? Because this family-run establishment turns out well-priced, generously-portioned, authentically-prepared Italian food. Furthermore, the interior makes me feel like I'm in Italy: elaborate wrought iron contrasts with laminex tables and plastic chairs. 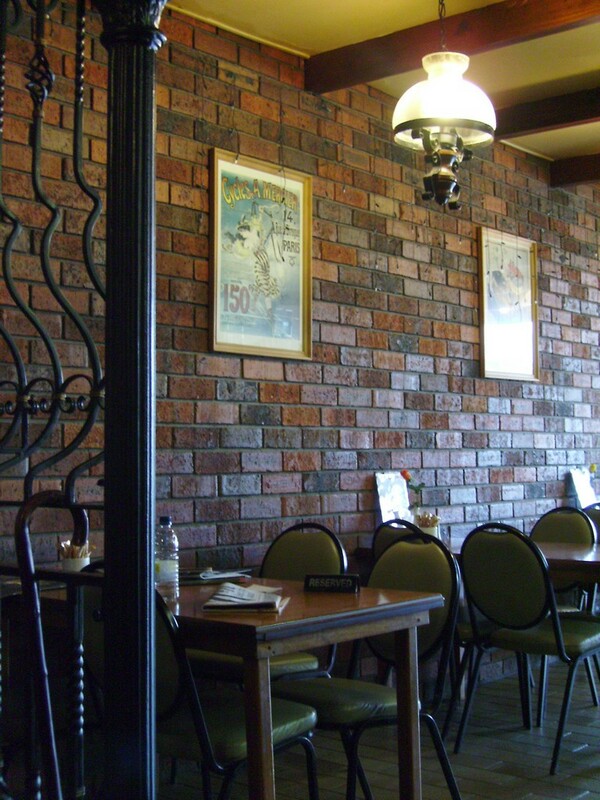 The walls at the front of the restaurant are exposed brick; at the back they're a colour-wall of various warm hues being tried on for size. 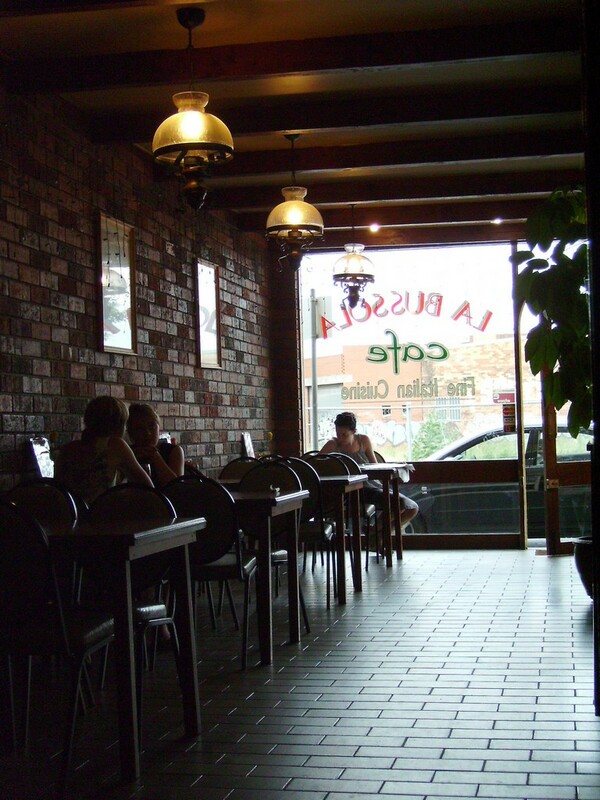 Their main business is pizza, and they do a nightly, bustling trade in takeaway. The menu, deftly held together on a clipboard at each table, also has a pick-and-mix pasta selection: you select the noodle and sauce of your choice, all at around $10. From this part of the menu I can highly recommend their amatriciana sauce. 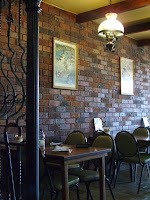 They offer various other plated dishes, with lots of seafood on offer, a saltimbocca, and a decent schnitzel. La Bussola also does good things on their drinks list. They offer house red and white at just $4 a glass, as well as several beers at good prices. Even Peroni comes in at $5 a bottle, I think. 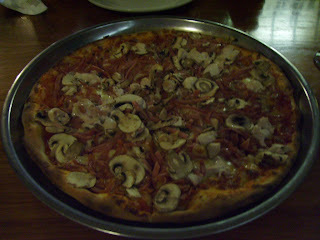 On our most recent visit the item of choice was a shared chicken pizza, with ham and mushrooms. It arrives steaming from the pizza oven and is suitably laden with toppings. While I'd never use it at home, I love a trattoria pizza strewn with diced ham. The pizzas are only lightly cooked, but the dough still achieves the crispiness you want to complement the toppings moored in the melted cheese. Excellent value, fresh, quality stuff.